Coordinators: Dunlosky John, Rawson Katherine A. This Handbook reviews a wealth of research in cognitive and educational psychology that investigates how to enhance learning and instruction to aid students struggling to learn and to advise teachers on how best to support student learning. The Handbook includes features that inform readers about how to improve instruction and student achievement based on scientific evidence across different domains, including science, mathematics, reading and writing. Each chapter supplies a description of the learning goal, a balanced presentation of the current evidence about the efficacy of various approaches to obtaining that learning goal, and a discussion of important future directions for research in this area. It is the ideal resource for researchers continuing their study of this field or for those only now beginning to explore how to improve student achievement. 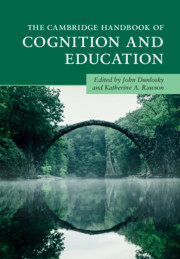 How cognitive psychology can inform evidence-based education reform: an overview of The Cambridge Handbook of Cognition and Education John Dunlosky and Katherine A. Rawson; Part I. Foundations: 1. How the learning sciences can inform cognitive psychology Keith Sawyer and John Dunlosky; 2. Quackery in educational research Daniel H. Robinson and Joel R. Levin; Part II. Science and Math: 3. Teaching critical thinking as if our future depends on it, because it does Diane F. Halpern and Heather A. Butler; 4. Improving students' scientific thinking David Klahr, Corinne Zimmerman and Bryan J. Matlen; 5. Spatial skills, reasoning, and mathematics Nora S. Newcombe, Julie L. Booth and Elizabeth Gunderson; 6. Iterative development of conceptual and procedural knowledge in mathematics learning and instruction Bethany Rittle-Johnson; 7. Development of fraction understanding Pooja G. Sidney, Clarissa A. Thompson and John E. Opfer; 8. Learning how to solve problems by studying examples Tamara van Gog, Nikol Rummel and Alexander Renkl; 9. Harnessing our hands to teach mathematics: how gesture can be used as a teaching tool in the classroom Elizabeth M. Wakefield and Susan Goldin-Meadow; Part III. Reading and Writing: 10. Fundamental components of reading comprehension Anne E. Cook and Edward J. O'Brien; 11. Writing as a learning activity Perry D. Klein and Aartje van Dijk; 12. Bilingualism and education: connecting cognitive science research to language learning Gigi Luk and Judith F. Kroll; 13. Note-taking Stephen T. Peverly and Amie D. Wolf; 14. Multiple text comprehension Jean-François Rouet, M. Anne Britt and Anna Potocki; 15. Interventions to promote reading for understanding: current evidence and future directions Elizabeth A. Stevens and Sharon Vaughn; Part IV. General Learning Strategies: 16. When does interleaving practice improve learning? Paulo F. Carvalho and Robert L. Goldstone; 17. Correcting student errors and misconceptions Elizabeth J. Marsh and Emmaline E. Drew; 18. How multimedia can improve learning and instruction Richard E. Mayer; 19. Multiple-choice and short-answer quizzing on equal footing in the classroom: potential indirect effects of testing Mark A. McDaniel and Jeri L. Little; 20. Collaborative learning: the benefits and costs Timothy J. Nokes-Malach, Cristina D. Zepeda, Elizabeth Richey and Soniya Gadgil; 21. Self-explaining: learning about principles and their application Alexander Renkl and Alexander Eitel; 22. Enhancing the quality of student learning using distributed practice Melody Wiseheart, Carolina E. Küpper-Tetzel, Tina Weston, Alice S. N. Kim, Irina V. Kapler and Vanessa Foot; Part V. Metacognition: 23. Self-regulation in computer-assisted learning systems Roger Azevedo, Nicholas V. Mudrick, Michelle Taub and Amanda E. Bradbury; 24. Improving students' metacomprehension accuracy Thomas D. Griffin, Marta K. Mielicki and Jennifer Wiley; 25. Calibration and self-regulated learning: making the connections Douglas J. Hacker and Linda Bol; 26. Teachers' judgments of student learning of mathematics Keith W. Thiede, Steven Oswalt, Jonathan L. Brendefur, Michele B. Carney and Richard D. Osguthorpe; 27. Learning strategies and self-regulated learning Philip H. Winne and Zahia Marzouk. John Dunlosky is a Professor of Psychology in the Department of Psychological Sciences and Director of the Science of Learning and Education Center at Kent State University, Ohio. He received the Distinguished Scholar Award in 2010 from Kent State University and is a founder of the International Association for Metacognition. Katherine A. Rawson is a Professor of Psychology in the Department of Psychological Sciences at Kent State University, Ohio. She has received numerous awards for her research, including the US Presidential Early Career Award for Scientists and Engineers, the Outstanding Research and Scholarship Award from Kent State University, Ohio, and the Outstanding Early Career Award from the Psychonomic Society.